Question: What are a few strange, interesting facts about the lower trapezius? Answer: Hmmm… nice question. Well, let me first point you toward the page on the lower trapezius, which explains the basics on functional anatomy of the lower traps. 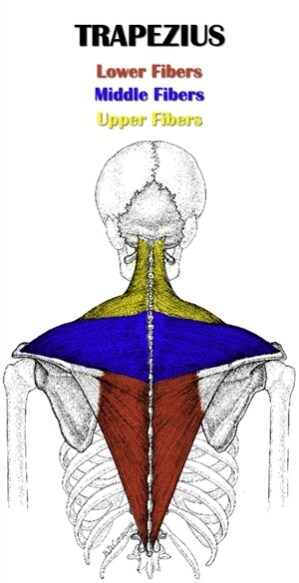 The lower trapezius fibers (one part of the larger trapezius muscle group – see picture) are located in the middle of the back. Having well developed lower traps is essential for scapular stability and mobility, specifically for scapular retraction, depression and upward rotation. Weak lower traps are a common cause of shoulder and scapula related injuries. Such injuries are likely to be occur on bench press or overhead press movements, which require scapular retraction, depression and/or upward rotation. It’s easy to accidentally ignore the lower traps when training, since they’re difficult to target unless you actively try to do so. Some exercises that are designed to hit lower trapezius fibers include scapular wall slides, the “prone Y” exercise, rear deltoid raises and face pulls. The lower trapezius muscle fibers also receive decent stimulation in rowing exercises such as the barbell bent over row. If you’re interested in reading more about the lower traps and how to train them, take a look at this great article by Mike Robertson: Top Priority for Lower Traps.